World Cancer Awareness Day - 4th February! World Cancer Awareness Day – Show your support on 4th February! World Cancer Awareness Day, marked on February 4 aims to raise awareness of cancer and to encourage its prevention, detection, and treatment. 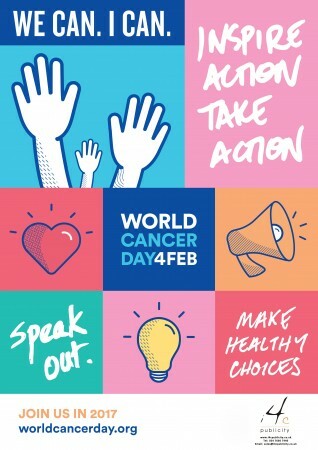 World Cancer Day was founded by the Union for International Cancer Control (UICC). The primary goal of the World Cancer Day is to significantly reduce illness and death caused by cancer by 2020. Cancer is the single name assigned to more than 100 diseases. Cancer is a result of abnormal cells that multiply and spread out of control, damaging healthy cells along the way. Most cancers result in tumours but those that affect the blood do not. Cancer can occur in any part of your body. More than 90% of all lung cancer cases are the result of smoking and 22% of all cancer deaths are due to lung cancer from smoking. Sleep deprivation caused by getting less than six hours of sleep per day increases your risk of colon cancer. Every day, more than 175,000 children being diagnosed worldwide each year. Cancer is the number 1 killer disease in children. Nitrates contribute to cancer. Meat such as sausage, hot dogs, and bacon contain a preservative/flavouring agent called nitrates. Preparation with high heat and ingestion causes a chemical reaction with the digestive fluids in your body, converting nitrates to nitrites. Nitrates also filter into groundwater from the use of fertiliser. The most common cancer-causing foods are refined sugar and flour, soda, microwave popcorn, food in cans produced with BPA, grilled or processed meat, and hydrogenated oils. Green tea, berries, turmeric, avocados, garlic, kale, and even dark chocolate are just a few that target and destroy cancer cells. 4th February is an opportunity for as many people as possible to come together and talk about cancer. We are i4c Publicity Ltd, one of the leading manufacturers of charity pin badges and take this opportunity to supply pin badges to various organisations.